NORTH EASTON, Mass. – Oliver Ames erased a pair of two-goal deficits in the first half and pitched a shutout in the second half, giving the #8 eight seeded Tigers their first ever playoff win with a 8-4 decision over #9 Apponequet. It took just over three minutes for the Lakers to take a two goal lead. The Lakers won the game’s first three face offs and Owen Cosgrove and Ryan Donovan found the back of the net to put Apponequet up 2-0. Oliver Ames had the answer though, finding the back of the net twice in less than a minute to tie the game. First, senior Aidan Connly and bounced a shot into the back of the cage and 38 seconds later, sophomore Eric LeBlanc dodged his way up the middle and tied the game 2-2. 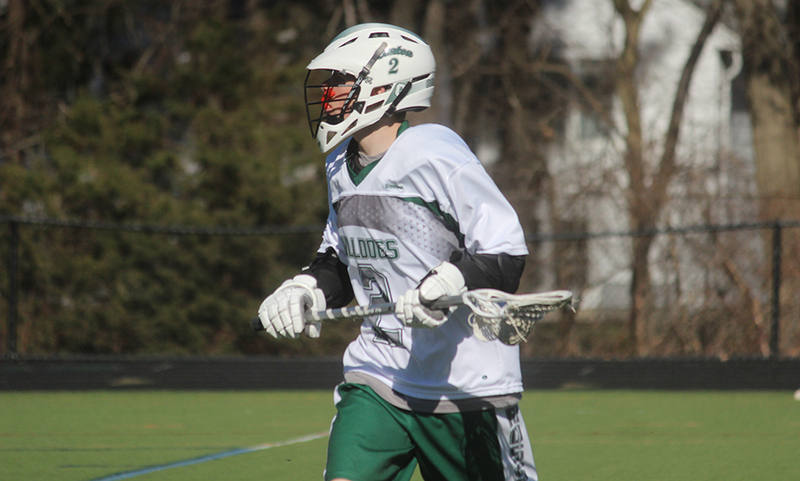 The Lakers had another strong start to the second quarter as Donovan had his original bid stoned by OA goalie Jake Aronson but the rebound bounced off the line. Apponequet once again gained a two goal lead when Jacob Hryzan muscled his way through a pair of defenders and finished to make it 2-0 five and a half minutes into the second quarter. passing sequence and Brown finished from close range. With under five minutes to go, took a feed from Connly and deposited it into the back of the net to tie the game heading into half. “I think initially there were some jitters and nervous with the whole moment,” DiGiacomo said. “It took a little while until they got the hang of things and got comfortable. We called the timeout and regrouped and the kids knew the game plan, I think they needed to just step back, not worry about the moment and just play. And that’s what they did. It was almost instantaneous after that and we scored a couple quick goals, the effort was fantastic. The Tigers, who won five of their final seven games in order to earn a playoff berth, completely controlled the play in the second half. OA opened its lead just over four minutes into the half when LeBlanc raced past his defender, stepped back in front of goal and easily found the back of the net to make it 6-4. It took less than a minute for Oliver Ames to capitalize on the momentum. The Tigers called out an isolation play for Gallagher and he took advantage, faking a spin behind the cage and wrapping around to make it 7-4. Oliver Ames capped the scoring, finding the back of the net for the third time in a two minute span when LeBlanc took advantage of a man up situation to make it 8-4. OA was forced into a man-down situation to start the fourth quarter because of an illegal stick. The Lakers tried to mount a comeback, firing two shots on net with the man advantage but both were turned aside by Aronson. Apponequet kept the pressure up, rocketing two more shots in the next minute but Aronson once again was there, picking up his 10th and 11th saves of the game. Max Howe, Kyle Agresta, Philip Saba and Max Sheldon all played well in front of Aronson. The Tigers’ close to the season and first ever playoff win are impressive on their own, but they did it all without their top scorer, senior Matt Gilson, who suffered a knee injury. Gilson led OA with 36 goals and 51 overall points despite only playing in 12 and a half games. Still, DiGiacomo was quick to point that Gilson was a big reason for OA’s win today. 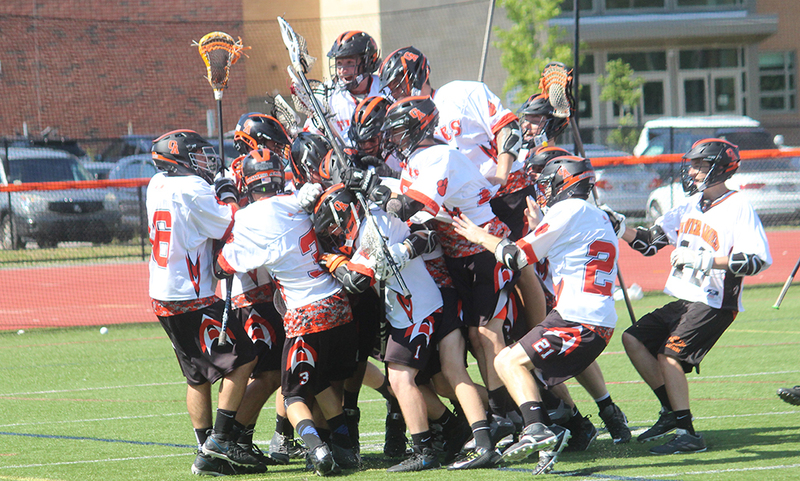 Oliver Ames boys lacrosse (10-9) now advances to the D2 South Quarterfinals to take on top-seeded Hingham (17-5). The Tigers will travel to take on the Harbormen on Thursday at 3:00. Taunton, 4 @ Oliver Ames, 7 – Final – Click here for a recap of the game. King Philip, 6 @ Catholic Memorial 8 – Final – Click here for a photo gallery from this game. Oliver Ames, 10 @ Milton, 7 – Final – Oliver Ames kept its postseason hopes alive, needing just one win to qualify with two games to go. Senior middie Aidan Connly had three goals and three assists, senior middle Connor Howe had a pair of goals and three assists, sophomore attack Eric LeBlanc had two goals and one assist, sophomore attack Owen Gallagher had two goals and senior middle Max Bamford scored once. Oliver Ames, 10 @ Foxboro, 9 – Final – Oliver Ames’ Matt Muir’s strong week continued as the sophomore pitched a scoreless bottom half of the seventh inning to seal the deal after the Tigers incredible comeback. Oliver Ames trailed 9-4 heading into the seventh inning but rattled off six runs to take the lead. Kyle Gagliardi had three hits for OA, Ryan Adams knocked in four runs on two hits and Mitch Goulet and Muir each added two hits for the Tigers. Taunton, 5 @ Mansfield, 3 – Final – Sophomore Christian Simoes blasted his first career home run off the foul pole in left field to break a 3-3 tie game in the top of the fourth to lift the Tigers. Taunton added a bases loaded walk in the same inning to create the separation. Mansfield struck in the first inning before Taunton took a 2-1 lead in the second and 3-1 lead in the top of the third. Mansfield tied the game in the bottom of the third with a pair of runs. Taunton senior Luke Figueira earned his fourth win of the season, scattering five hits in five innings of work, striking out two. Max Bowden earned the save, striking out two while not allowing a hit in two innings of work. Matt Machado had two hits, an RBI and a run scored, Charles Hearrold III had two hits, two RBI and a run scored and William Emerson added two hits for Taunton. Mansfield junior Zack Peterson had a pair of doubles and runs scored, Aidan Cahill had two hits, an RBI and a run scored and Mike Arnold had an RBI for the Hornets. Milford, 3 @ Stoughton, 4 – Final – Click here for a recap from the game. Canton, 2 @ Sharon, 4 – Final – Sharon junior Clara Cook recorded 11 strikeouts and only allowed five hits to pace the Eagles to their second straight win. Senior Rachel Usen was 2-3 with two runs scored, freshman Rebecca Clayman had a pair of singles, an RBI and a run scored and senior Jenny Friedman was 2-3 with a pair of singles. King Philip, 13 vs. St. Peter Marian, 0 – Final (6 inn.) – King Philip wasted no time jumping all over the defending D1 State Champions, plating 10 runs in the first inning. Christa Wagner went 3-3 and Hailey McCasland, Meghan Gorman and Jenn Hutnyan all added two hits for the Warriors. Hutnyan closed out the game with a two-run home run for KP. Kali Magane pitched three innings for the Warriors, striking out eight of the nine batters she faced. Mansfield, 0 @ Taunton, 10 – Final – The Tigers used a six hit, six run sixth inning to break open the game and score a big win over Mansfield. Taunton loaded the bases in the first but a throw home from Marissa Staffier and a pair of strikeouts helped the Hornets get out unscathed. Taunton scored one run in the second, one in the third and two in fourth to build a lead. Aimee Kistner continued her shutout streak to start the season, pitching six inning, striking out 13 with just one walk. Courtney Fisher retired the side in order in the seventh for Taunton. Meghan Navarro went 3-3 with a double, Liana Duarte was 3-4 with a triple and an RBI, Jordan Wade was 2-4 with a triple and an RBI and Jaime Brown went 2-3 and knocked in a pair of runs. Mansfield freshmen Megan Letendre, Mady Bendanillo and Caty DeMassi each had a hit for the Hornets. Milford, 8 @ Stoughton, 0 – Final – Milford’s Kelley Reichert only allowed two hits in five innings of work, striking out four to earn the win for the Scarlet Hawks. Kate Irwin had a pair of hits and stolen bases, Jess Tomaso was 2-4 with a triple and an RBI, Jill Powers knocked in a pair of runs and both Maddy Bonvino and Shannon Cormier hit a homerun. Stoughton freshmen Freshman Jordan Lyons and Jeni D’Andrea each had a hit as well as sophomore Val Whalen and senior Nicole Bodette for the Black Knights. Canton, 4 @ Foxboro, 5 – Final – Click here for a recap from the game. Milford, 1 @ Oliver Ames, 16 – Final – Oliver Ames senior Max Bamford and sophomore Owen Gallagher paced Oliver Ames’ offense, finding the back of the net four times apiece. Sophomore Eric LeBlanc added a pair of goals and assists for the Tigers. Sharon, 10 @ Mansfield, 18 – Final – Caroline Maher led the way for the Hornets with five goals and Marie Foley added four. Katy Garvin also had a hat trick for Mansfield, which also got two goals apiece from Julia Todesco, Emily Aarons and Maggie Dunn According to head coach Alexis Kobey, Cat Daly and Kaleigh Jodice played well on defense and Victoria Lawlor had a great game in goal. Oliver Ames, 17 @ Milford, 4 – Final – Oliver Ames’ Abby Duval paced an explosive Tiger offense in a big win on the road. Duval finished with a team-high five goals, adding two assists as well. Sam Lang and Erin Fitzgerald each netted a hat trick with an assist, Sofia Masciarelli and Hannah Friend each scored twice and had an assists, Devin Gardner had an assist and a goal and Emalyn Duvall scored once for OA. Ariana Waldorf made 10 saves in net for the Tigers. Sharon, 5 @ Canton, 0 – Final – It was a clean sweep for the Eagles, who didn’t drop a game in four of the five matches. Griffin Fein (first singles), Han Cui (third singles), Adam Dobbin and Alex Romantz (first doubles) and Tilak Mehta and Danujan Thiru (second doubles) all won 6-0, 6-0. Sharon sophomore Fred Bondar completed the sweep with a 6-3, 6-1 win at second singles. Canton, 0 @ Sharon, 5 – Final – Sharon didn’t lose a game at two of the three singles matches and won all five in straight sets. Lulu Yuan won 6-2, 6-1 at first singles while Nupur Shulka and Emily Wen each won 6-0, 6-0 at second and third singles, respectively. Pooja Puttigampala and Michel Kondratiev won 6-3, 6-2 at first doubles and Sydney Gordon and Akhila Songadi won 6-1, 6-0 at second doubles for the Eagles. Foxboro, 3 @ Oliver Ames, 2 – Final – Foxboro won all three singles in straight sets without dropping a game to edge the Tigers. Diana Prinos (first singles), Sophia Prinos (second singles) and Lexi Nelson (third singles) all won 6-0, 6-0. Oliver Ames’ Valeria Tueme and Claudia Ferrara battled for a 7-6 (7-3), 7-6 (7-4) win while Rachel Stryke and Olivia Groebe won 6-3, 3-6 7-6 (8-6) at second doubles for the Tigers. Mansfield, 2 @ Taunton, 3 – Final – Taunton swept both doubles matches and sealed the win with a victory at second singles. Junior Olivia Sweeney won 6-2, 6-4 at second singles while juniors Ashleigh Eason and Emily Moor won 6-4, 7-6 (7-5) at first doubles and junior Caroline Hebert and freshman Jillian Pagliuca won 6-2, 6-2 at second doubles. Mansfield’s Paulina Martin won 6-2, 6-1 at first singles and sophomore Sarah Doyle on 6-3, 6-0 at third singles. BROCKTON, Mass. 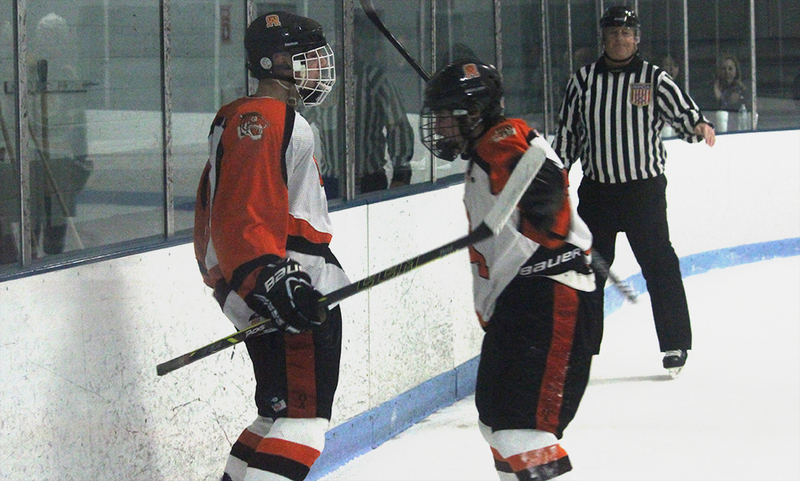 – After a back and forth battle through the first two periods, Oliver Ames scored three unanswered goals in the final frame to pick up its second win of the season with a 6-3 decision over King Philip. Senior captain Matt Mancini netted his first career hat trick, sophomore Owen Gallagher had three assists and a goal and the Tigers outshot the Warriors 38-16. Both teams had leads in the first period but went into the first intermission tied and then traded goals in the second period to stay level with just a period to go. With the game tied 3-3, the Warriors went on their first power play of the game just before the midway point of the third period. It looked like KP would take its third lead of the game as time was about to expire in the man advantage but Jacob Kelly’s shot rang off the crossbar. Oliver Ames was able to corral the puck and cleared it out. The puck took a funny hop off the glass and landed right in front of Gallagher. The sophomore was unable to get a shot off on his breakaway with a KP defenseman chasing behind but Gallagher was able to keep possession behind the net, looked up and found a wide open Max Ward in front and the freshman went five hole to give OA a 4-3 lead. The Warriors had another man advantage with 2:30 to play but less than a minute in, a turnover turned into a chance for the Tigers. Gallagher was able to race up ice and went to the left of the net, drawing the attention of two KP defensemen. Gallagher calmly used his backhand to feed a wide open Mancini in front with a no look pass and the senior completed his hat trick to seal the game with 1:32. Gallagher scored on an empty net goal with 27 seconds to play. “In the last two games we’ve given up goals in the last couple minutes of the game which is not a good habit to have,” Oliver Ames head coach Mark Homer said. “It was an unfortunate penalty but I just told the guys they had to collapse around the net, leave it all out on the ice, block shots and every chance we have, clear the puck. We had veteran players out there to take care of it. [King Philip’s] a good team, they are scrappy and they work real hard. King Philip opened the scoring in the game despite a dominant start from OA. The Tigers had the first seven shots on goal but it was the Warriors who found the back of the net with 11:29 to go. After sophomore Collin Cooke was unable to convert a breakaway chance, he stayed with it and tossed a centering pass that deflected off a defenseman and in to make it 1-0. Less than two minutes later the Tigers nearly tied it up but KP goalie Shane Frommer came up with a huge glove save to rob Cullen Gallagher in the slot. Frommer finished with 32 saves. The Tigers were finally able to solve Frommer midway through the first when sophomore Eric LeBlanc slammed home a rebound off a shot from senior Max Bamford at the blue line. Oliver Ames then cashed in on its first power play of the game near the end of the period. Owen Gallagher picked up the puck along the far side boards and fired a pass right in front for Mancini to tap in. Just when it looked like Oliver Ames would go into the first intermission with the lead, King Philip’s Richie Lucente found Cooke open in front with just 8.3 seconds left and the sophomore buried it to send the teams into the break tied 2-2. The Warriors took their second of the game just over three minutes into the second. Nick Connor was able to keep control after a hit along the near boards and send a centering pass that Lucente got his stick to to roof the puck for a 3-2 lead. King Philip nearly doubled its lead by OA goal Zach Walsh made a tremendous point blank save on Cooke from right in front. But once again, special teams helped bring Oliver Ames back into the game. The Tigers went on the power play with 2:58 in the game and converted when Jared Costello found Mancini in front right after the penalty expired to tie the game with 1:24 left. Despite having two man-advantage opportunities in the final period, the Warriors saw Oliver Ames capitalize as a result both times. “We just really couldn’t get the puck to settle on that power play,” first year KP head coach Paul Carlow said of the late advantage. “They got it cleared all the way down and we just never really got in sync after that. A little inexperience maybe, a little too much running around, a little guys trying to do too much. Then we coughed it up and they get the odd man rush. “We really didn’t play a good first period. We came out at flat and they dominated but our goalie kept us in it. I felt the second period we controlled the play and it felt like we played much better in that period until we took a penalty and gave up the power play goal. I thought we played we played the first half of the third pretty even. If we capitalize at the end of the second on the breakaway or on the [first] power play in the third, and we had our chances, we just weren’t sharp tonight. It felt like we played in spurts. Oliver Ames (2-1) will play host to Taunton (5-1) on Saturday at Asiaf when Hockomock League play opens. King Philip (2-3) will look to bounce back on the same day when they take on Foxboro at the Foxboro Sports Center at 4:30. BROCKTON, Mass. 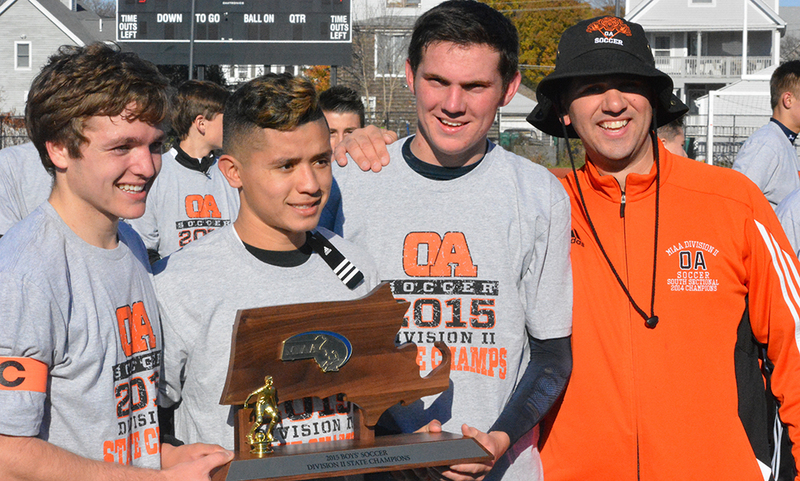 – For the second straight year, Oliver Ames is the D2 South Sectional champions for boys soccer. 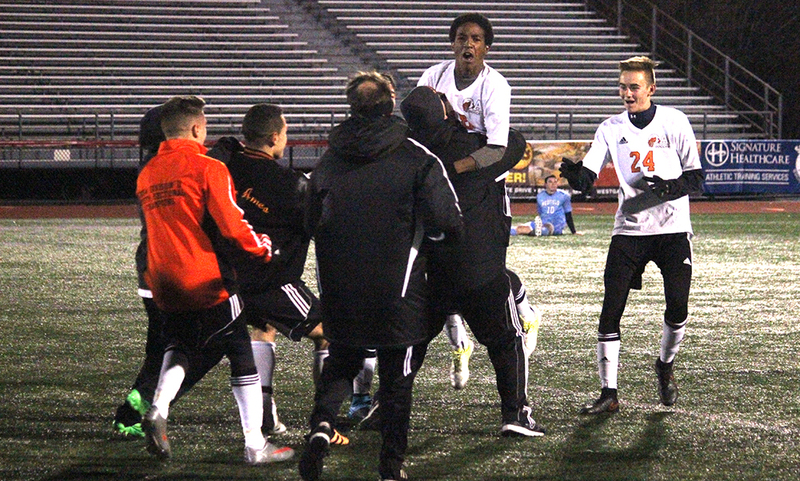 Sophomore Nathaniel Cardoza scored the golden goal in the second overtime in the 95th minute minute to give Oliver Ames a 2-1 win over Medfield, the 16th seed who had made a Cinderella-like run to the finals. The Tigers dominated portions of the first half, the majority of the second half and then most of both overtimes but couldn’t break the deadlock until Cardoza placed a shot with his right foot at the far post to give Oliver Ames the win. Cardoza gained possession at the top of the area and originally put the ball onto his left foot — his dominant foot — but with no shot available, he was able to keep control, touching to his right foot and unleashing a perfectly placed shot for the winner. It was a bit of deja vu for the Tigers when Medfield’s John Cahill found the back of the net to give the upset-minded Warriors the lead in wth 27th minute. Cahill decided to take a chance with a defender in close range and his shot took a deflection and looped into the net at the far post giving no chance for OA sophomore keeper Jack Carroll. It was a frustrating goal for OA to concede, especially since there were two good chances to take the lead inside the first 15 minutes. In the 9th minute, senior Keegan Nutt played a ball over the top of the defense and classmate Chris Romero ran through but got under his shot and hit the crossbar from close range. In the 16th minute, Romero served in a tempting corner that sophomore Cam Vella got a head to but it bounced just wide. In the 25th minute, just prior to Medfield taking the lead, Romero had a great shot from 25 yards out that bounced off the chest of Medfield goalie Matt Johnson but he was able to collect the rebound before any players could pounce on it. The second half belonged to OA from the get go and sophomore Jack Sheldon nearly pulled things level in the 43rd minute. A long throw from senior Max Bamford deflected to Sheldon and he took a chance on goal but it went just wide at the near post. In the 53rd minute, Barata elected to change things up a bit, going with a look similar to that when the Tigers scored the game winner against Hingham two games prior. Romero moved to the left flank and pushed sophomore Mason Galbato into a holding position in front of the defense. That moved Vella to a more attacking position up front. The change paid dividends pretty quickly as OA found the equalizer just six minutes later. Sheldon served in a cross from the right flank that was hit back across the face of goal. Medfield made its first mistake of the night in the back as the ball got past a defender and fell right to Vella. The sophomore took a heavy touch forward and then finished with his right foot at a tight angle to make it 1-1. “I think it helps us pressure up a lot because Cam’s a really good offensive player,” Cardoza said of the change. “I love to play with [Vella] and I love Mason because he keeps the stability in the midfield when he drops back there. OA kept up its pressure but had to deal with a late free kick chance from the Warriors, who relied heavily on the counter attack in the second half and overtime. A free kick from 25 yards out was cleared wide to Romero, who quickly played a long ball up field. Nutt ran onto it, headed it forward and tried to go over Johnson from 18 yards out but didn’t get enough on it and Johnson’s leaping stop prevented a winner in the 79th minute. Medfield had a chance less than five minutes into overtime after the Warriors were able to handle a rush from the Tigers. Kevin McCordic let the ball run across his body and ripped a left footed shot but it rolled wide at the far post. With just two minutes gone in the second overtime, Medfield was awarded a free kick right at the top of the box. The shot hit the wall in front and went over the net and the Tigers were able to deal with the ensuing corner kick. Three minutes later, Cardoza converted the game winner to send the Tigers to the D2 EMass/State Finals for the second straight year. Oliver Ames now improves to 17-0-3 and will play in the D2 State Final on Saturday, November 21st. The Tigers will either get a rematch with Concord-Carlisle or will play Masconomet in the finals with a time and location still to be announced.